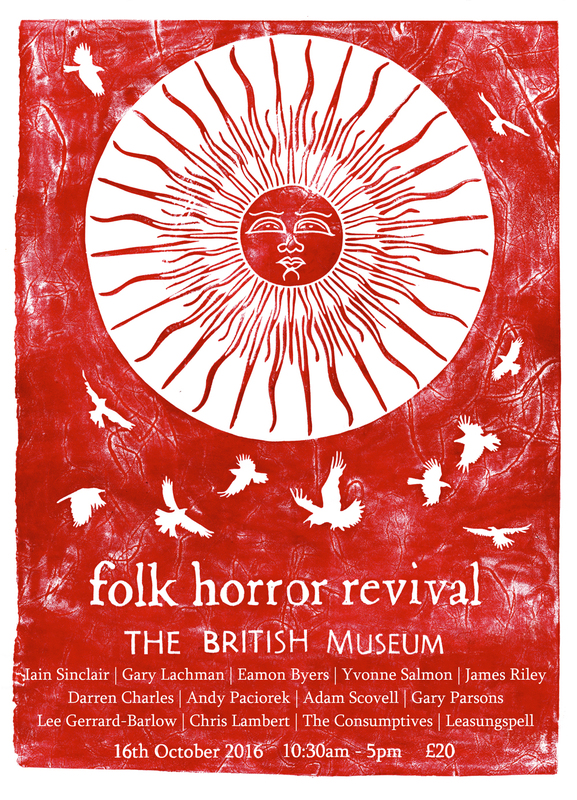 Folk Horror Revival, a group dedicated to all things weird, folkloric and hammer-horror-y asked me to create this poster for their first event, to be hosted by the British Museum on 16th October 2016. The posters will be on sale on the day, with proceeds going to the Wildlife Trusts, along with those from sales of books from their Wyrd Harvest Press. It's all about Christmas here this weekend! 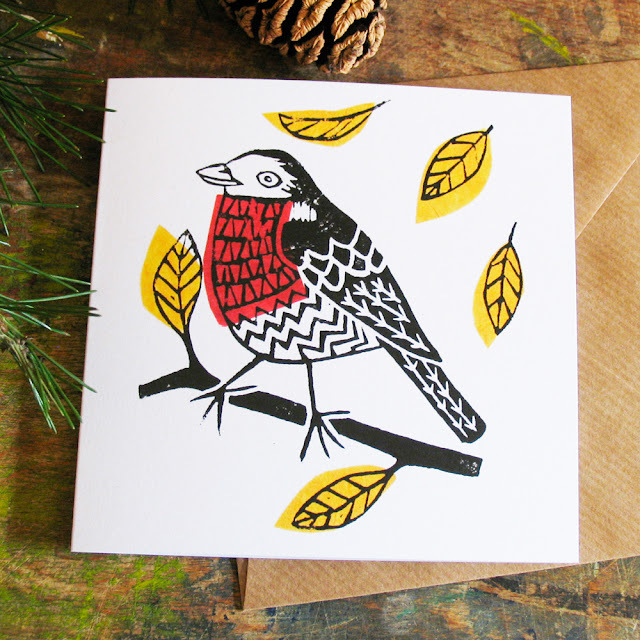 I've still got some little robin cards for sale in my Etsy shop, individually or in packs of five, sustainably printed in Cornwall on 100% recycled card stock with brown craft envelopes, from my original lino print collage. They're also available in Dukki, the wonderful Nottingham-themed shop in Nottingham's Broadmarsh centre. If you're local and you haven't been in there yet do pop in and say hello - almost everything's made in store or locally, and designed exclusively by owner Heidi Hargreaves and her artist partner Ian Jones. They're on the top floor just a few units on from the caves. I've also put up some new giclee repro prints of my popular L'il Red print and the Sight & Sound magazine cover illustration of The Tales of Old Weird Britain. 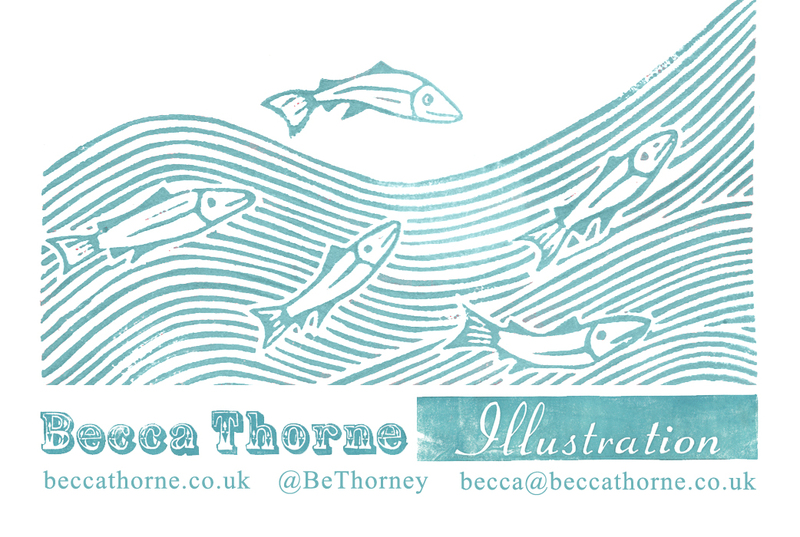 Visit my shop for these and more, including hand-printed tote bags and other gubbins. There is only one place where you can legitimately get the festive lights up in early November, and that's anywhere celebrating Diwali (and once they're up, they might as well stay up til Christmas)! One year, when we were living in Leicester, Diwali and Bonfire night were just a couple of days apart, and the fireworks were amazing. If you're in Leicester tonight, head over to Belgrave Road, where there'll be fireworks, light displays, fire dancers and other celebrations, particularly in Cossington Recreation Ground, and the shops of The Golden Mile will be open late. Leicester has one of the biggest Diwali celebrations outside of India, so if you miss it this year, remember it for 2016! 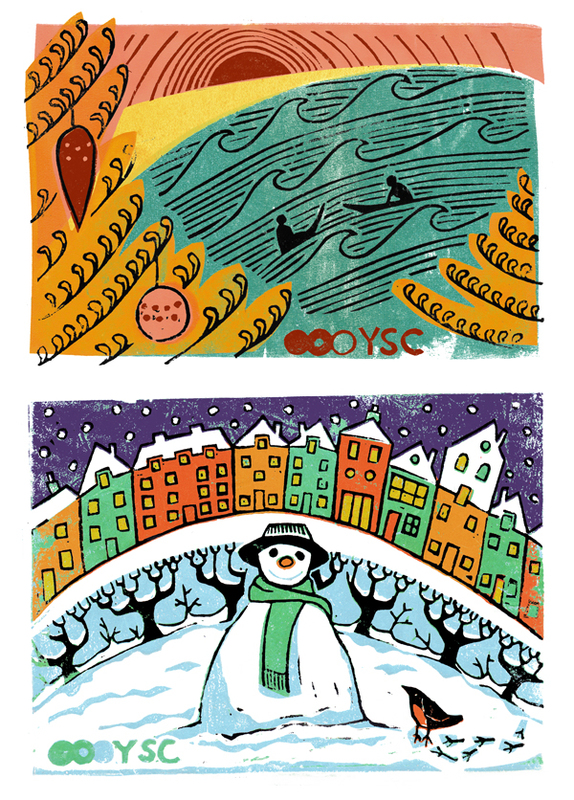 This piece was commissioned by YSC India. Shubh Deepawali to all! I'm still busy working on my children's book (you can continue to follow my progress on Instagram and Tumblr), but in the last few weeks my attention's been focussed on a couple of other projects. 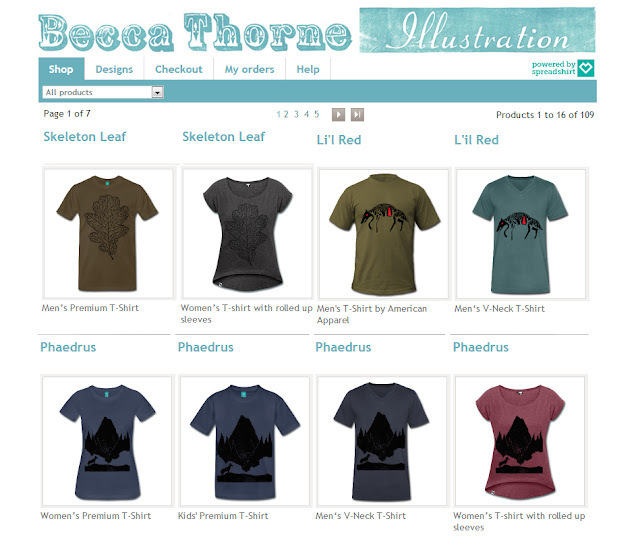 The first is my new Spreadshirt shop, beccathorne.spreadshirt.co.uk. 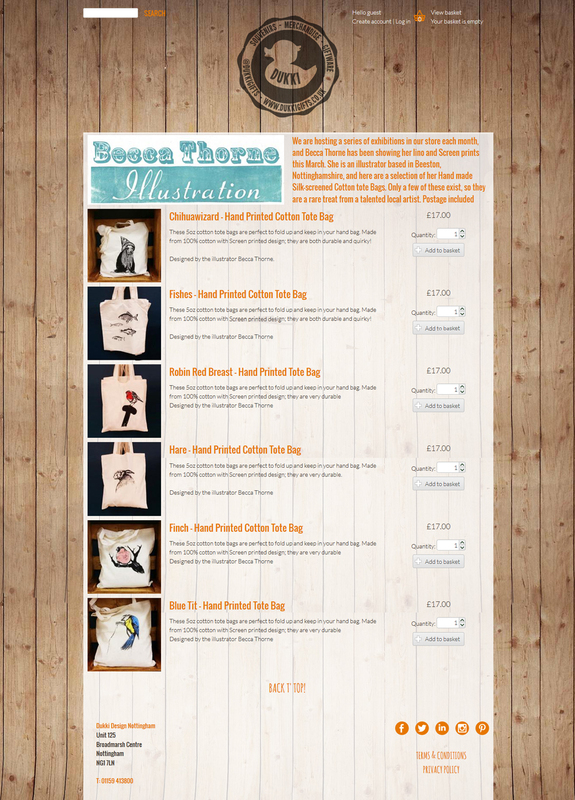 Most of the designs are on T-shirts only right now, but I've added a few other products - bags, flip-flops, cushions etc - with my Whales and Waves design, just to test the water. So if you like the look of the other products, but want to see them with more designs, please let me know and I'll create some. Likewise, if you've been eager to see a particular print available on anything, but I haven't yet uploaded it, leave me a comment and I'll get on it! More styles, colours and designs available! You can find out a bit more about Bishop on her blog, A Broke Bridget. 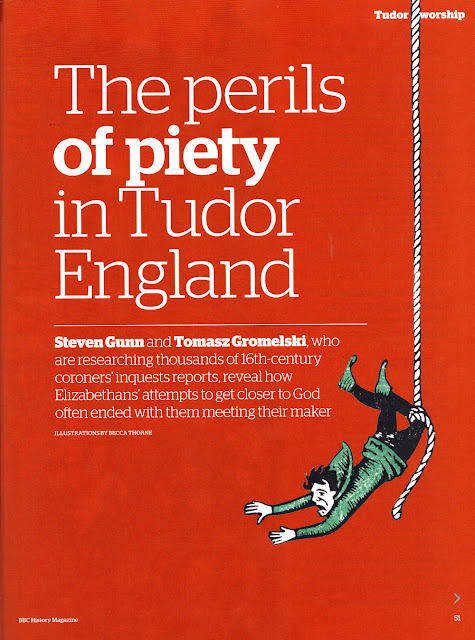 This month's BBC History Magazine features my illustrations for another article by Steven Gunn and Tomasz Gromelski, furthering their research into accidental deaths in Tudor England. This time they look at deaths caused in and around churches. 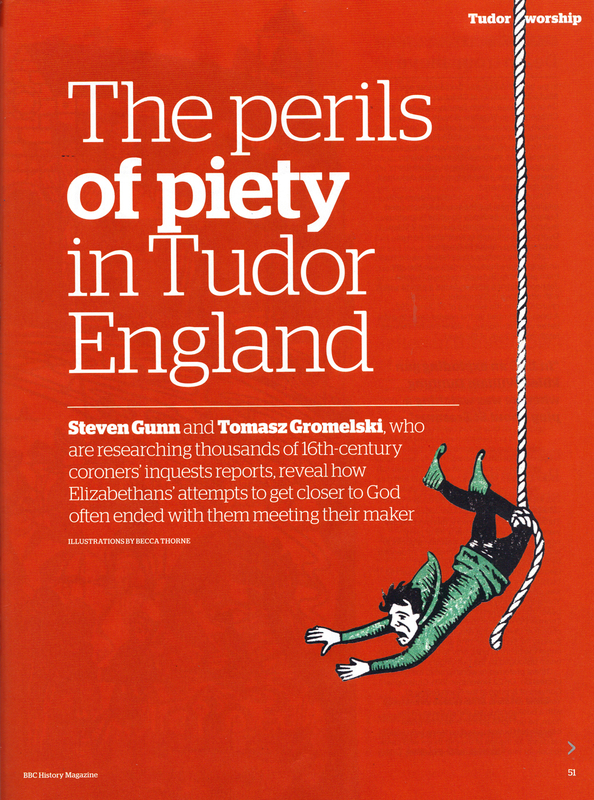 Piety was apparently a dangerous business in Elizabethan England, and death could come from dislodged stones, falling books, campanology or the catch-all 'divine providence'. 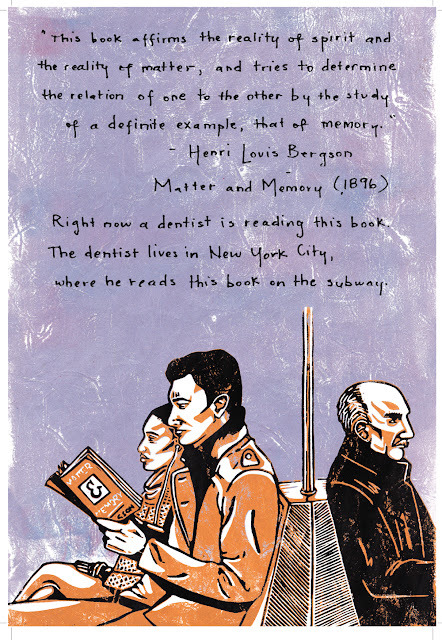 The main illustration features some of the everyday activities that led to fatalities. The wonderful folk of Nottingham's Dukki Gifts are now stocking my hand-printed bags in their online shop. Every bag is 100% unbleached cotton, with long handles for slinging over your shoulder and hand silk screened by me from an original print or sketch, and all are limited edition. They're on sale for a very reasonable £17 with UK p&p included. 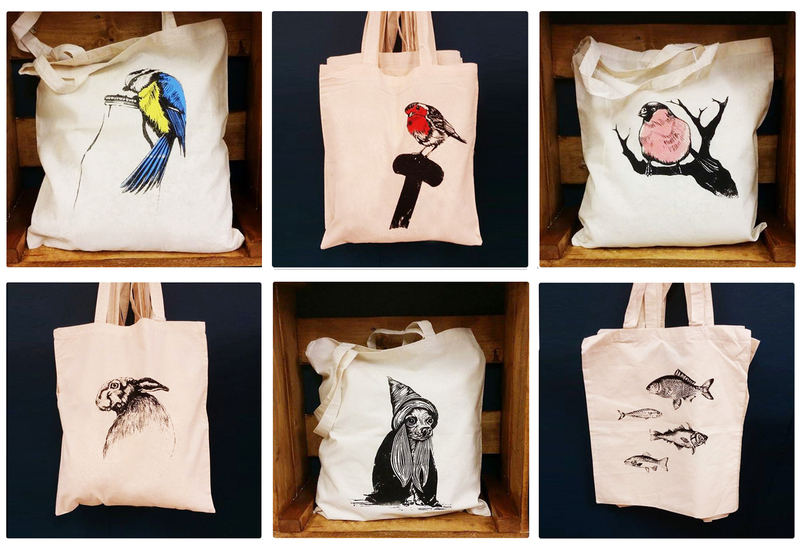 Head on over to dukkigifts.co.uk/shop where you'll find my six designs, as well as Dukki's own range of Nottingham-themed jute and cotton totes. Check out the rest of their shop too, they've got all kinds of goodness in there. 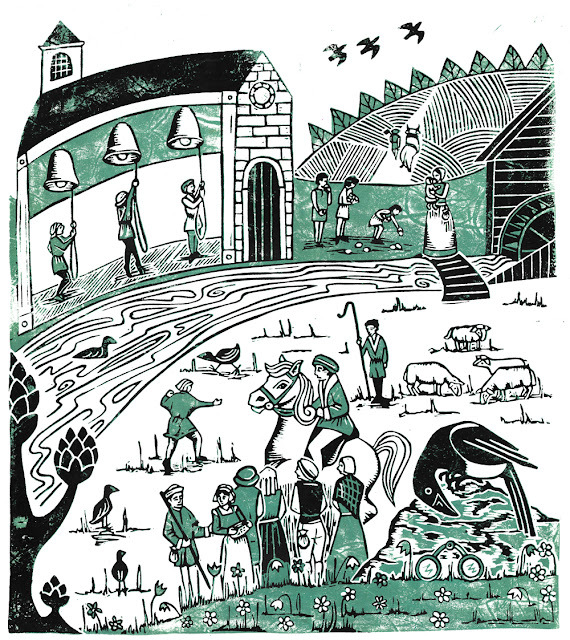 From Saturday 15th March I'll be taking part in The DUKKI Showcase, a celebration of local artists, designers and makers, organised and curated by the lovely folk at DUKKI on the upper floor of Broadmarsh, Nottingham. 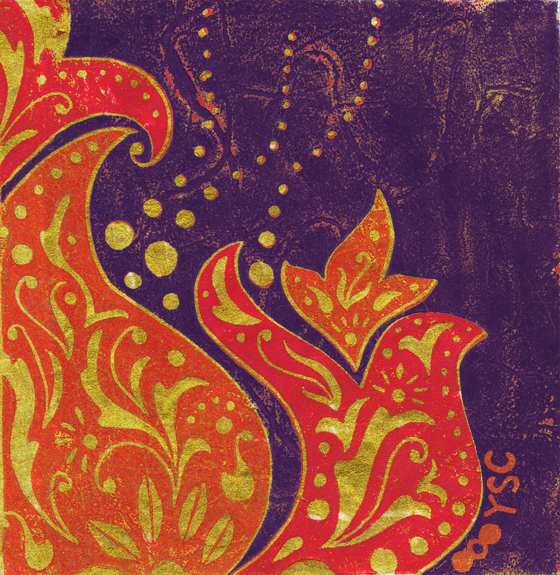 Each month DUKKI will dedicate two weeks to a different local artist, showcasing their talents and selling their wares. February was all about DUKKI's own Ian Jones, a talented digital painter and illustrator who specialises in colourful, whimsical pieces inspired by street art and local goings-on. He's recently been dabbling in gorgeous black and white wild animal portraits, check them out on his Instagram account, @nonsenseprophet, where he's always sharing new work and sketches. After me will be Farah Batool, who creates stunning ceramic jewellery that I can't wait to see in real life. I may have to treat myself to a little something when her turn comes around in April! My exhibit will be on from 15th-29th March and all pieces will be for sale. 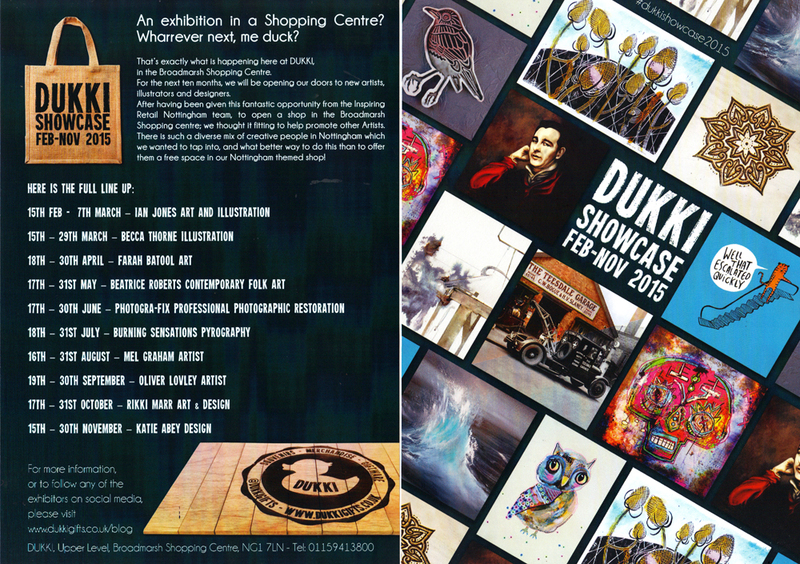 The Showcase continues into November, follow DUKKI on Twitter or Facebook for updates and further info. Click the image below for a larger version.